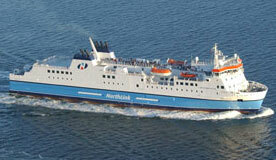 NorthLink ferries serve Scotland, Orkney, and the Shetland Islands with regular sailings. Use the search facility below to check fares and book NorthLink Ferries securely online. NorthLink Ferries transport passengers, cars, and other travel essentials from Scotland to the Orkney and Shetland Islands. Three amazingly comfortable passenger vessels operate from Aberdeen, Stromness and Scrabster (near Thurso.) The passenger fleet consists of the MV Hamnavoe, MV Haitland and MV Hrossey. Passengers 16 and over must have a photographic ID to check on board. These include a driving licence with photo, a passport, a student’s ID card or concessionary card. Booking is ticketless so passengers need to have their booking confirmation number also when checking in. Stromness departures leave at 0630 (except Saturday and Sunday), 1100 (0900 on weekends), and 1645 (daily.) The trip takes 90 minutes and return trips from Scrabster depart from 0845 (except weekends), 1315, and 1900 (daily.) During the peak travel season from mid-June until mid-August ships include the 0630 departure and 0845 return. From the port at Aberdeen ships leave at 1900 Monday, Wednesday, and Friday; and at 1700 on Tuesday, Thursday, and Weekends. With a stop-over in Kirkwall, passengers arrive at Lerwick the next day at 0730. Facilities on each ferry are provided for disabled passengers. Four cabins are designed to accommodate disabled individuals on the overnight routes; two are fitted with lifting equipment. These cabins have wheelchair access with electrically operated doors and sinks; toilets are fitted with rails and handles. Support animals have full ship access. NorthLink Ferries pride themselves in giving every passenger a safe, comfortable crossing. Their ships have several cinemas, shops, internet access, restaurants, bars, and in cabin video on demand. A special children’s play area with small chairs and tables, suitable toys for various ages, games and other activities is provided, along with television shows specifically geared to young ones. Pets brought onboard are not allowed in cabins or internal public areas. Kennel facilities should be booked in advance. More than one pet may share a kennel if their owner desires. Large and small dog kennels are available with solid ceilings, walls and floors, and mesh gates. The kennel room is heated and ventilated. Passengers should supply food and water bowls for their pet and a blanket or basket for their animal to sleep on during transport. Animals must be on a lead while on company property and waste removal by the owner is required. NorthLink ships have modern, clean, fully-equipped cabins built with comfort in mind. Each suite includes a shower, toilet and washbasin, individual temperature controls and tea/coffee making facilities. Two-berth outside cabins windows allow plenty of natural light and afford a roomy feel; fixed side-by-side beds provide exceptional comfort. Executive suites have more space for a work desk making them ideal for business travellers; upper and lower bunks complete these cabins. Premium cabins have been newly added; these two-berth outside cabins add satellite TV, complimentary shortbread and mineral waters. Four-berth inside cabins have two lower fixed berths and two pull-down bunks; these are perfect for families or groups travelling together. They may be reserved with TV which means children can plug in game consoles for entertainment. Individuals may choose to cabin-share by booking only a berth at very reasonable prices. Those sharing cabins are requested to show consideration for their fellow travellers. Passengers who choose not to book a berth can include access to NorthLink’s recliner lounged along with the ticket. Hire of blankets and pillows is provided at the Northern Isles Shop on board. Those travelling in the summer months on the 0630 crossing can book a “bed and breakfast” cabin, boarding the previous evening between 2130 and 2330. NorthLink Ferries are a wonderful choice for any holiday traveller planning their day, weekend, or extended trip to Orkney and the Shetlands.